Salestack brings lead discovery into a new era. 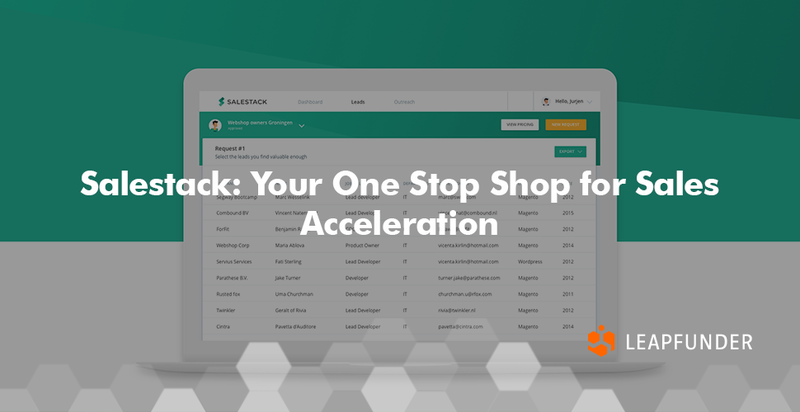 It changes the way businesses: select, qualify and warm-up their sales leads. It also saves their clients up to 90% of their time prospecting by generating qualified leads succeeded by automated and personalized outreach solutions. 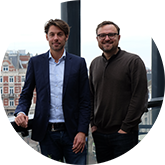 Find out what problems they’re trying to solve, why they chose Leapfunder as their online funding platform and what are their plans for the upcoming months. 1. Hi Jeroen, thank you for agreeing to do the interview. 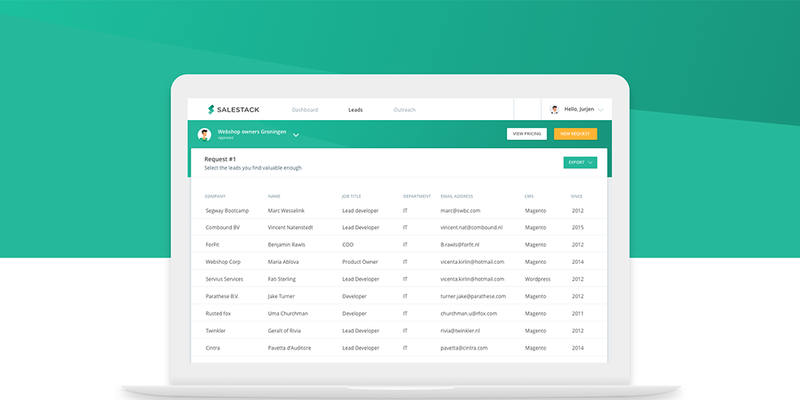 Tell us about Salestack, the idea that got it all started and the amazing team behind it. When doing sales ourselves in another company we really saw how hard it could be to prospect your leads. There was literally nobody who liked it in any sense. When we later read an MIT article stating that on average 30% of all sales representatives spend around 30% of their time doing sales on prospecting (which is nothing more than finding new ideal clients and actually getting in touch with them). That was the moment that we were sure that we needed to find a solution for that. We had a solution in mind, simple to use for every sales representative but complex if you look at the technology. Therefore we searched for the right people with the competencies needed and only the best ones got on the team, building Salestack.io. We’re solving the pain of prospecting. A salesman is specialised in making deals with clients. And that should be his activity. With prospecting 30% of your time salespeople get demotivated, less productive and less comfortable going into a new sales call. In regular prospecting the chance of getting somebody on the phone who wants to talk to you is minimal. You hear no constantly, and it keeps on taking your time. Compare it to picking up a girl at a bar in which everybody did it – and not always with the desired success. After asking the girl to dance fo 99 times, wouldn’t you doubt asking her for the 100th time? The pain of hearing that no is exactly the same as real sales representatives feel without a solution for prospecting. 3. How much growth potential do you see for Salestack and what type of investors are you looking to attract? The last year, our launching year, we ran most experiments with clients and focussed more on segments and the pricing model instead of sales. We saw that Salestack’s solution is doing well and that we’re solving a real pain. Almost all clients understand it immediately and go for a sale. Direct competition is not very active since we offer a mix of a tech solution, shared with our sales knowledge and experience. We want to share that knowledge during the contact we have with our clients and teach them how to improve their awareness of a constant flow of new leads and have a steady pipeline. We’re constantly optimising this concierge model towards an automated AI suggestion solution, but we’ll still need to feed that principle. Growth is depending on the quality of our solution and our service level. The market is large since it has all of the companies relying on sales. We have three focus segments and we can grow globally, in Europe and in the Netherlands by 10-35% per month. We chose Leapfunder as our online funding platform because we think it’s the most transparent solution. Chasing investors is a tough job and you need experience for a larger round, but looking back you can be satisfied that you managed to create a strong bond with the investor. That is extremely important. We have a clear goal with the investment. We had a launching year to make a lot of mistakes, learn from it and experiment as much as possible with product and pricing. Currently, we have a very stable and motivated team, but no dedicated sales representative for ourselves. When extrapolating the average sales we made per day we made sure that we can grow with large steps. Internationally we’re partnering up with a sales related firm who can use our solution for their clients. That makes it more easy to cover international markets. Finally, we use a share of the investment for extra manpower in our development team, that can react fast to the feedback we keep receiving from our clients. Currently, we’re implementing a marketing strategy for the first time, which will activate leads and customers easier and will generate more hot leads towards us. Now we’re ready to do some sales and show it! Thank you for your insights, Jeroen. We wish you and the Salestack team the best of luck!